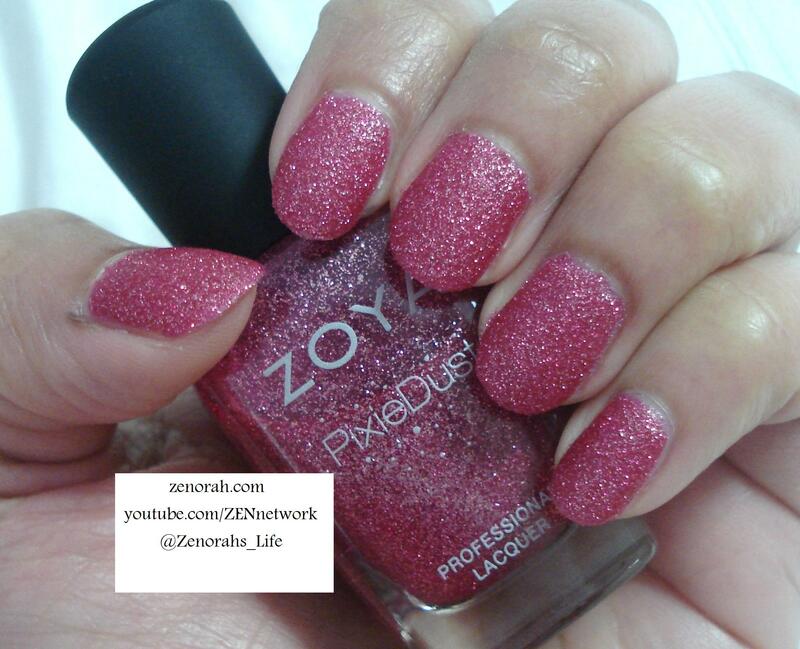 Hi everyone, today I have a new polish from Zoya’s Summer 2013 Pixie Dust Collection. Textured nails is definitely the trend of 2013 and I quite welcome it because I was NOT a Shatter nail polish fan (I do own two Shatter polishes and I am not a fan of them at all). Zoya is one of my favourite brands & they truly impressed me with their Pixie Dust line – I have to give them credit for the amazing sparkle/glitter/”pixie” effect when this polish dries & they named this finish aptly. 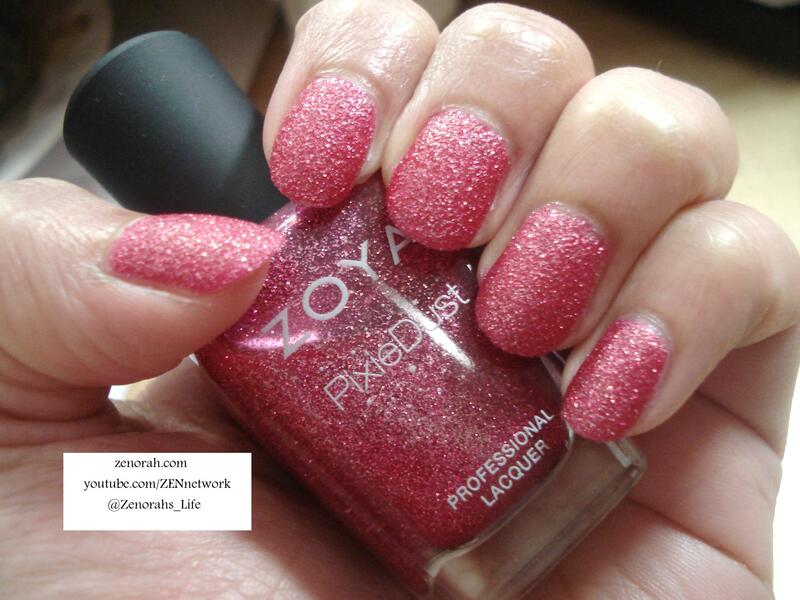 Zoya ‘Miranda’ – is a mid tone pink polish with berry undertones with silver glitter particles set in their Pixie Dust formulation. This is part of their Summer 2013 Pixie Dust collection and to me was the odd ball out of all the colours which is why I wore this one first. And because I am still in a pink polish mood these days. You can really see the silver glitter shining through in this photo – in sunlight it literally looks like ‘pink diamonds’ which reminds me of Rihanna’s ‘Diamonds’ song lol. This is two coats of polish to achieve an opaque manicure & one of the best features of the Pixie Dust polishes is you do not have to wear a base coat (which Zoya fairies recommend to achieve the best results)!! While it doesn’t require a base coat it does take a little longer to dry than most polishes so you do have to be patient with these Pixie Dust polishes. While it does take longer than average to dry, once it dries it lasts about ONE full week without chipping!! And being a textured polish it does have a gritty feeling on the nails – I found it to be a little “heavy” on the nails but I will give it points for making my nails feel strengthen in some way. These polishes look more beautiful in sunlight than indoors as well but if you are looking for something new in the nail polish world I would give this a try!! Overall, I am really intrigued by these Pixie polishes & while I am not a trend follower, these textured polishes are growing on me. And if you are pink nail polish lover – I would get this polish because you may regret missing out on it in the future. 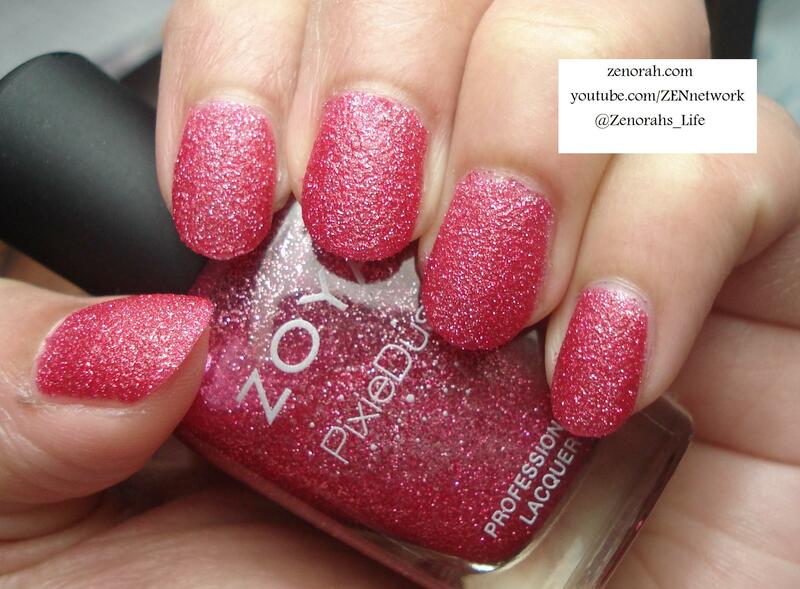 Do you own Zoya ‘Miranda’? What are your thoughts on this nail polish? Love the PixieDusts! In fact, I just wore this exact polish for my vacation – that included two days at a water park – and it stayed beautiful for the week!! I have my eye on the silver & navy blue one! possibly the dark purple as well =) how about you?? Definitely the dark purple and silver, but also the orange-red! Ohh i love Destiny as well! Have you tried Solange? would look gorgeous on you!! they’re my favourites from the collection. I haven’t tried OPI liquid sands as of yet…might grab one soon to compare formulas.